announced UCI race in Stellicom but we’ll see) and I went out happy. 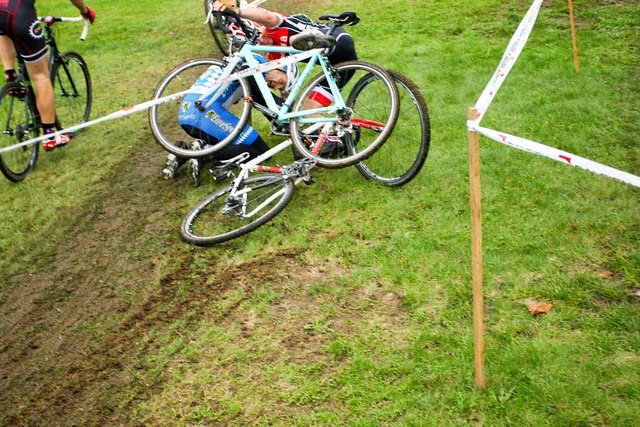 The previous race –the Starbucks GP and Marymore Park – was a total kerfungle. I went down on the first lap and from that point on the wheels had totally come off the bus, I had no energy and almost DNF’d. Had I not had the team tent to deal with I probably would have just rolled into the parking lot, threw my bike in the car and drove home. Sunday’s race at Woodland Park proved to be a bit of a redemption. Coming into Sunday’s race I was worried that I’d lost my mojo, so far I’d had a great season but maybe that was all I had – the tank was dry. Somehow I’d managed to hold onto third for the series and all that I had to do to stay on the podium was finish in the top ten to hold on; I wasn’t sure it this was possible. Hard rain and heavy winds had pounded the course all night and when I arrived at 7:30 the course was greasy mud covered in large maple leaves. The MFG volunteers were hard at work raking leaves and setting tape and by the time my race came around the course was nearly devoid of leaves – but the mud remained. Eighty one racers packed the starting line – a big turnout even by MFG standards. Zac gave us the go ahead as a light rain began to fall. I had a great start was sitting comfortably in third when we hit the first run-up. Good thing I installed new fangs onto my shoes. I tried to keep on my toes as I sprinted up the hill in hopes of preventing clogged cleats. No just luck. Oh well everyone else is in the same boat. Woodland is a really good course for me, a big uphill, some flowy downhill and just enough twists and turns to keep you on your toes. Jan passed me on the first uphill and was gone. A mystery man was holding second, Luke third, Rob fourth and me fifth. At the start of the second lap Rob started having problems and I moved into fourth with Dodi hot on my wheel. Dodi eventually came around and despite my best efforts to hold on he slipped away. Instead of being deep and grabby the mud at Woodland Park is shallow and greasy. It also has a propensity to clog treads and pack cogs: by the second lap the dense mud had me reduced to two working gears. The gear deficit only became a problem on the road section, but it didn’t seem to cost me any places so I really can’t complain. I’m sure my competition had similar issues. Near the end I was passed by an HSP guy, I held on to him fairly closely but in the end he took fifth and I settled for sixth. I have to say that this was a super successful race. At the start I didn’t know where I stood, but by the end I knew that I was still able to race strong and to make a good showing. The guys who beat me were stronger on the day and that’s something that I’m totally fine with. I ended up maintaining my third place standing for the season, something I’m super happy about.